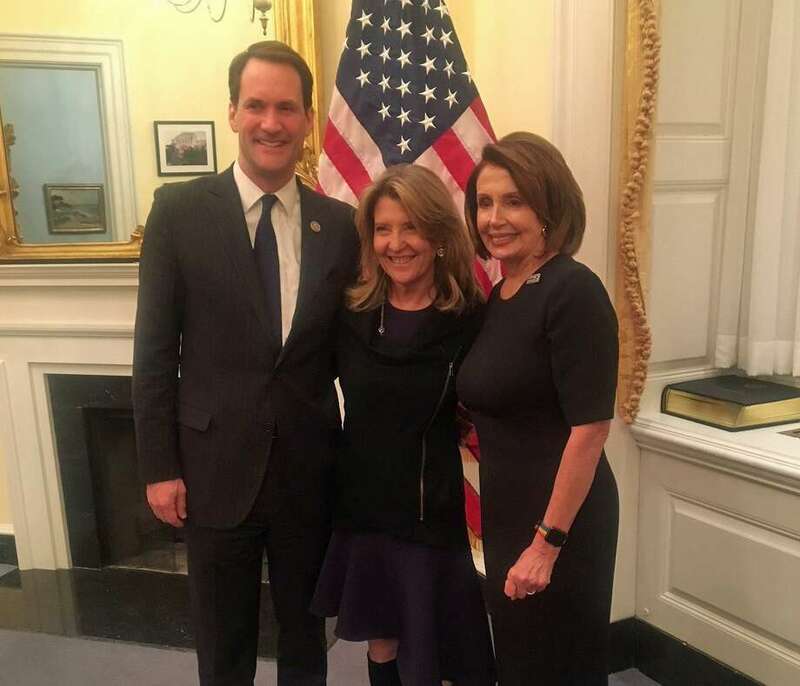 Cindi Bigelow, CEO of Bigelow Tea, with U.S. Rep. Jim Himes, left, and Senate Minority Leader Nancy Pelosi prior to Tuesday's State of the Union address. FAIRFIELD — As a wife, mom and CEO of Bigelow Tea, Cindi Bigelow has had quite a few different experiences and opportunities in her life. But Tuesday night was a first for Bigelow, as she sat in the United States Capitol’s gallery during the State of the Union address, as the guest of U.S. Rep. Jim Himes, D-Conn. The Bigelow mark on the town is a very visible one. The town’s senior center was renamed the Bigelow Center for Senior Activities in 2015 because of monetary support the center has received over the years from Bigelow. And the road that runs along one side of the Fairfield Metro train station and leads to Bigelow Tea was renamed Constant Comment Way, a play on its signature tea, Constant Comment. Q: Have you ever been to a State of the Union address before? A: No. This is the first for me and I (was) very excited to see something so important up close and personal. Q: What was your reaction when you first received the invitation? A: I was completely honored to be chosen to represent the wonderful state of Connecticut. Q: What were your expectations prior to attending? A: As the CEO of Bigelow Tea, I view leadership as a careful combination of vision, inspiration and drive. I (was) interested in what the president (would say) in his remarks and how those words relate to those important tenets. Q: What was it like to be in the gallery for a State of the Union address? A: Sitting in the gallery and being exposed to all the legislators that have dedicated their careers to our country was quite an experience. Also meeting many of the guests that the various legislators brought and hearing their stories was also both inspiring and humbling. It certainly will be a night I will not forget. Q: What was your biggest take-away from the evening? A: I’m not sure I can pick one take-away from the evening. There were so many topics that were discussed. Clearly from an economic standpoint, our country continues to do well. However, I am concerned for the immigrants in our country. The conversation seems to group entire countries into very small categories. I try to never forget that this country was built by immigrants. And those living in the United States today that came from other countries are performing very needed and essential jobs that we all benefit from. However, for me, the night represented one which I will always remember. It was an exposure, in person, to an event that very few people have the opportunity to experience. I feel very fortunate.